Freesat allows you to receive free to air programmes via satellite. A minidish or sqish dish is installed and aimed at the Astra 2 satellite at 28 degrees east of South. The dish requires a clear line of sight to the satellite and in rare cases trees or buildings may block the signal. If in doubt get an engineer to survey the site. Humax are the leading the way with Freesat boxes. The HDR-1100s is Humax's flagship model, a twin tuner box with a 500GB/1TB hard drive for recording purposes and on demand content such as iPlayer and Netflix. Freesat have their own program guide that allows you to see what's on for the next 7 day, now with the addition of Freetime you can also find programmes that you may have missed over the last 7 days on channels such as BBC & ITV. Listings can be selected by genre and more information about a program can be found when pressing the info button on the remote control. A dish is required to receive Freesat with either a single LNB for the standard receiver or a Quad for the recordable receivers such as the HDR-110s .Any Sky minidish is compatible with freesat. In areas where a dish is not allowed then a Sqish Dish is a discreet alternative to a standard minidish. Our engineers install Freesat systems in Tunbridge Wells, Tonbridge, Crowborough, Sevenoaks, Heathfield and in the Medway and Maidstone areas. Prices vary depending on requirements and we do deals on Freesat packages with a receiver dish and standard fitting. 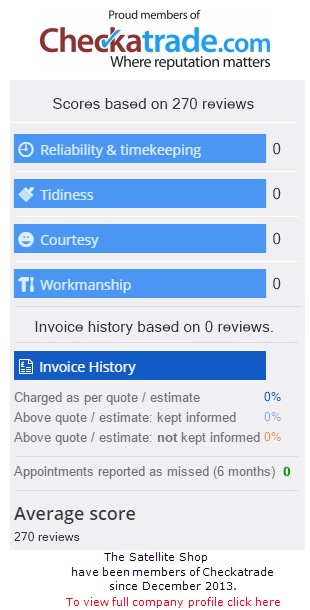 We always discuss and agree all costs before we install and offer FREE local surveys. We also give a 2 year warranty on all Freesat systems we install. It is possible to run multiple receivers off the same dish with a quad (4 way) or octo (8 way) LNB. If more feeds are required then you can use satellite multiswitch with up to 32 outputs. It is also possible to distribute the Freesat signal from one receiver to two or more TVs but an RF modulator will probably required as no Freesat receivers currently have a modulator built in.